After managing to successfully leave the Doyle Hotel relatively unscathed, we pushed on further into Pennsylvania. As you may have gathered from the previous post The Halfway Hangover we didn’t greet this task full of gusto and vigor but rather kept plugging along, putting one foot in front of each other. Unfortunately, at this point in the hike, the upcoming rocks seemed to be the topic of any hiker conversation, just leading to a building sense of dread for the last 80(ish) miles of Pennsylvania after leaving Port Clinton, PA. So how bad were they really? 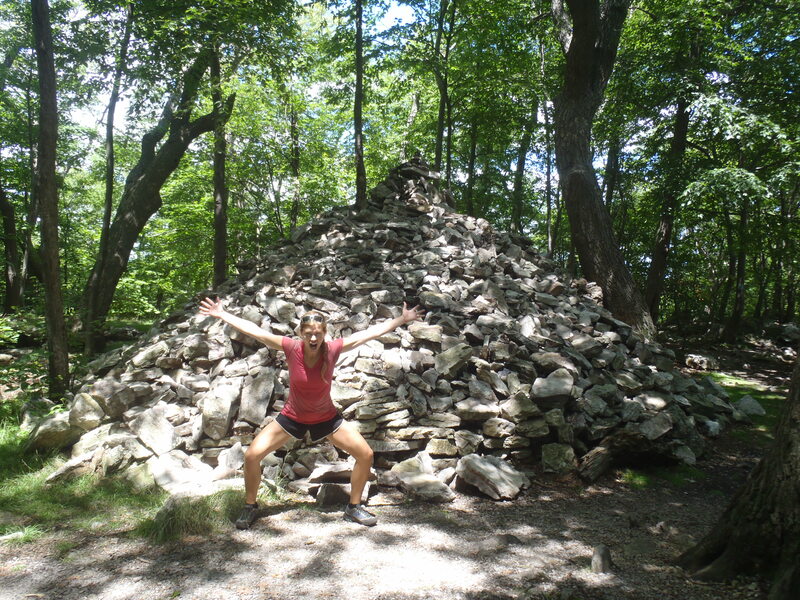 Lindsay with a giant pile of evil PA rocks! Despite what the picture shows, no we didn’t have to walk 80 miles of piled up rocks. In all honesty, the legend of the PA rocks is bigger than its bite. With that being said, 80 slow miles of pointy rocks and granite slabs with few rewarding views can get very old, very quickly. When talking about this section in camp, most hikers tell of trail with pointed granite and marble rocks so thick that not even a blade of grass could grow through and a hiking shoe cannot touch dirt for miles. Fortunately, we did not have 80 miles of trail like this; but we did have painfully rocky and painfully slow sections every day. 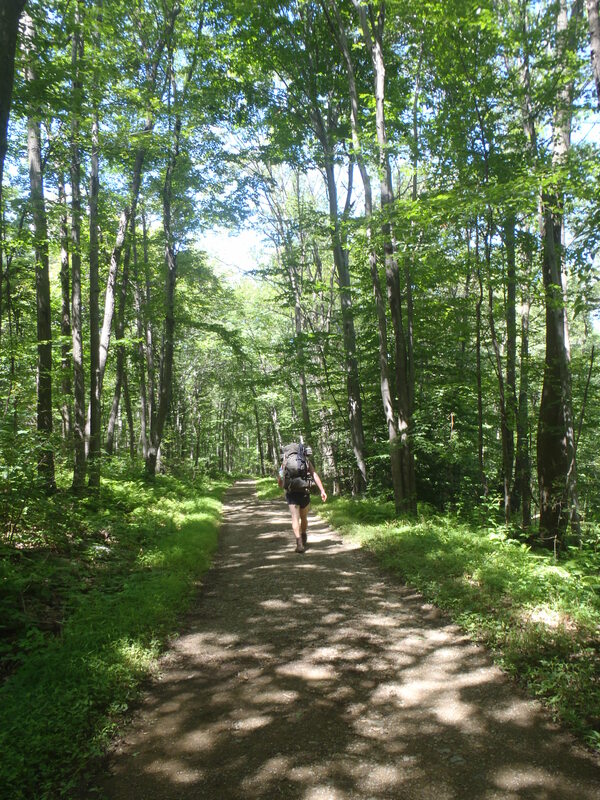 It seems that in designing the Appalachian Trail through Pennsylvania the trail developers aspired to take hikers to most of the unique and visually impressive terrain features in the Appalachian corridor. What this design led to is, of course, a trail leading to many of Mother Nature’s tourist attractions that could not be reached by vehicle. In time this evolved into a short day hike from one of the many roads that bisect the AT in Pennsylvania and thus improved trail conditions to these destinations. However, part where AT Thru-Hikers pay the price is the trail between the natural wonders that hasn’t been worn down and developed as much. That’s where the rock monsters live. 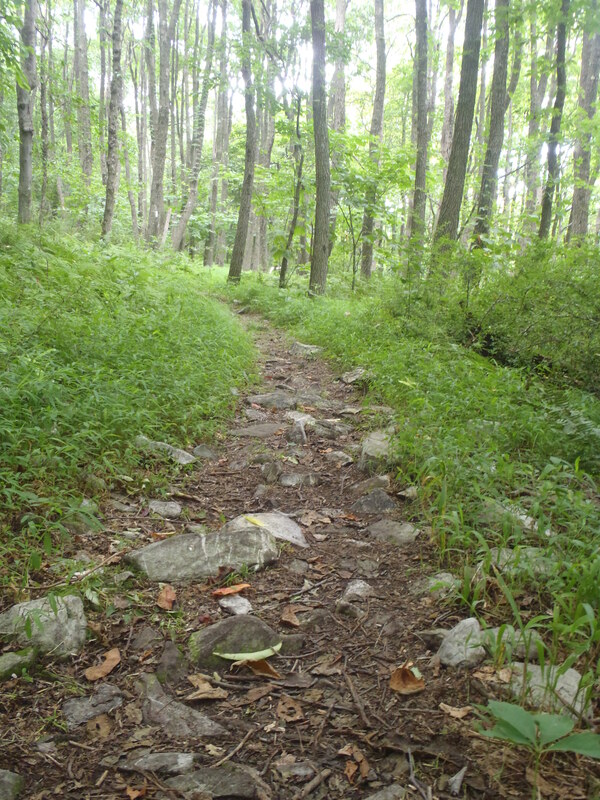 For instance, the trail between PA309 and the Knife’s Edge or the trail between Ashfield Road and Bear Rocks are both nice sections that any hiker can maintain a good pace without any major hiccups. Now, the section between the Knife’s Edge and the Bear Rocks is only hiked by thru-hikers and the mentally challenged and is a much slower, foot hurting and frustrating slog at barely a mile per hour. Fortunately though, at least half of the rocky section of PA had old dirt carriage roads, improved trail and even the occasional gravel road to counteract the miles of slow, rocky steps. Looking back, the rocks were never that bad, but rather a nuisance that had to be conquered before getting back to the nice dirt paths of New England! A typical section of trail in the 80 mile rocky section. Climbing up the Lehigh Gap, these are REAL rocks! 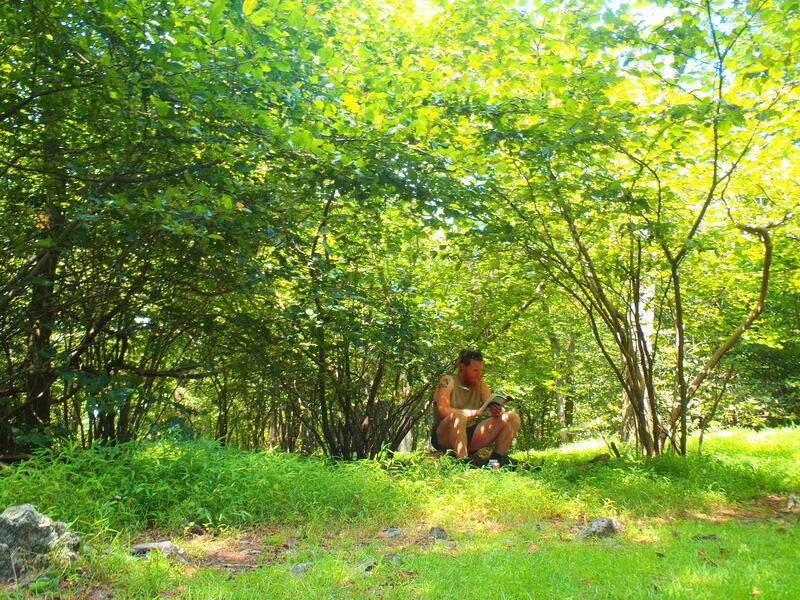 When we successfully made it through the third longest state on the AT we decided that we had earned a few days off and to rest our feet near the town of Delaware Water Gap, PA. Located on the New Jersey border and a traditional celebratory stop for hikers who had completed the PA section, Delaware Water Gap is an interesting mix of thru hiker culture and tourists heading from New York City to the Poconos which are only 50 miles away. At this point we didn’t have sensation in our toes and we were quite beat up mentally, physically and emotionally. The cure? A room at the Econo Lodge, take-away Chinese food, a 12 pack of Sam Adams and a Marvel super-hero movie marathon on AMC! 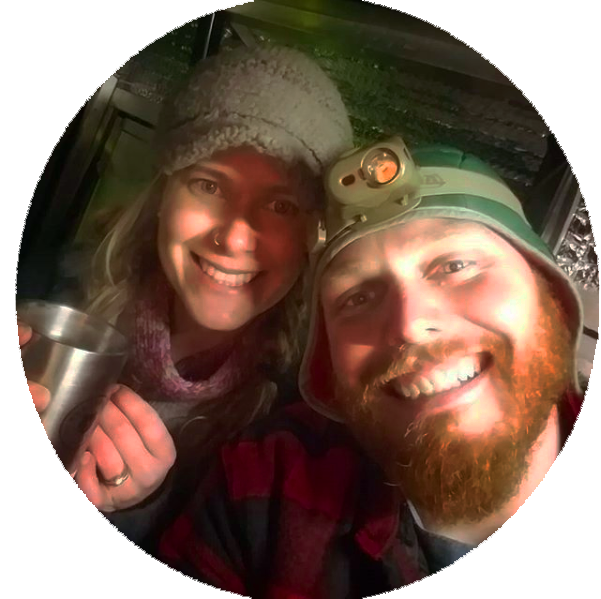 We didn’t want socialization with our peers, we couldn’t even think about hiking down the trail and wouldn’t entertain the thought of sleeping in our tent outside of town when a bed could be had for a reasonable rate. We ended up taking two full “zero days” in Delaware Water Gap where we ate, rested and even bought a new pair of shoes for Lindsay. We hoped that two days off would be just the ticket for our push into New Jersey and into the promise land of New England. I mean, 80 miles of rocky trail ends at a political boundary drawn 300 years ago, right? 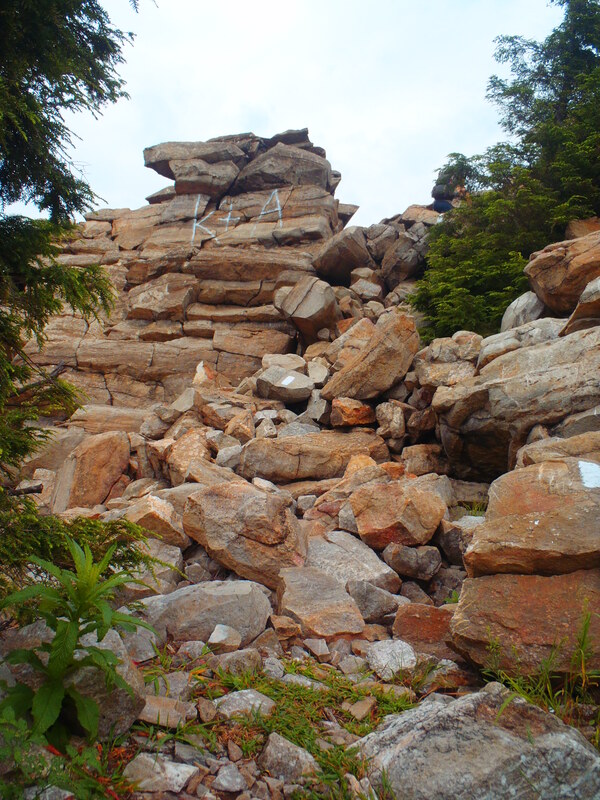 The Pennsylvania rocks had no chance of turning into New Jersey rocks, right? It’ll be easy all the way until New Hampshire, right? 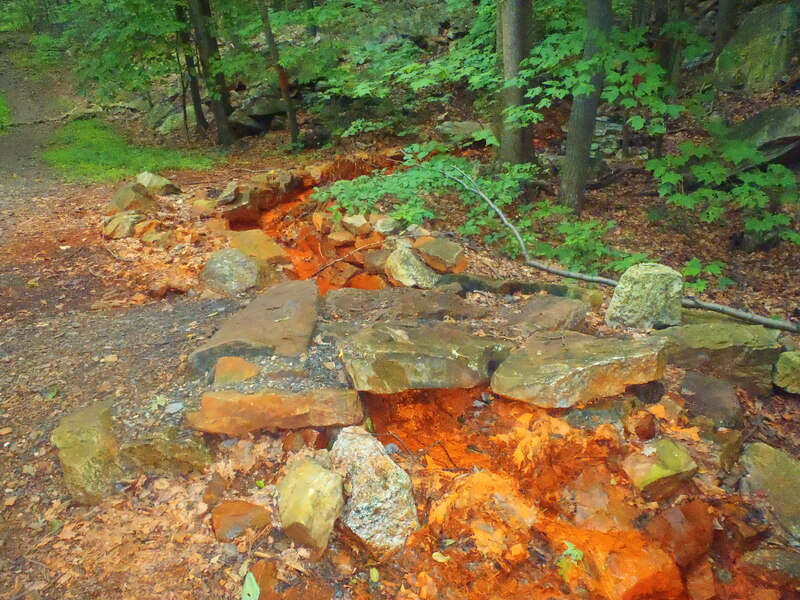 Typical trails in Pennsylvania… they are actually pretty when your feet aren’t throbbing! Not so much. The rock formations caused by the most recent North American glaciation period continued across the Delaware River and quickly erased our hopes and dreams of big mileage and easy walking. Because of our double-zero in DWG we had a tight timeline to meet a family member in New York and thus had no room for lighter days and taking it easy. We did three of our biggest mileage days in a row, going almost 80 miles by the third night which is a pretty substantial task for Lindsay and I. When we made it to Greenwood Lakes, NY it was not a pretty sight. After two days of rest we thought we could conquer the remaining miles of the Mid-Atlantic without breaking a sweat. That’s when we had a very abrupt slap in the face that the Appalachian Trail might have EASIER sections but there was no such thing as an EASY section. New Jersey broke us down and sucked any ounce of “fun” that we had in Pennsylvania out of us. New Jersey had some nice views that we didn’t want to stop to look at, delis on the side of the trail that did nothing to help morale and plenty of venomous snakes to make us glad that we had sent Hunter (the dog) home to Maine. Walking into Greenwood Lakes, NY with such a negative perspective we had the realization that the time had come to do something different and make this journey something we could look back on positively and not a waste of a summer! There might be a bit of iron in the water in PA you’re saying? P.S. New Jersey also had an equally hilarious and terrifying bear experience… but you’ll have to check out the book I plan on writing this fall to get that story when it is published. If you want a trailer let’s just say that it involved a genetically evolved bear in camp, fear of fighting a bear naked and stolen Vicodin. Oh yeah, and you’ll have to wait to hear about the night we spent “in jail” in Palmerston, PA.
Where are you now? I’ve been expecting to run into you two sometime this week or next. I did a flip flop, and I’m about to pass by Andover, ME; after I watch the Browns game tomorrow in Rangeley. We just made it to Andover last night, we must’ve missed you on the trail somehow. The Mahoosuc Mile is fun, New Hampshire is grand and Vermont is the best state we’ve had so far. You’ve got a lot of good stuff to come my friend! Nooooo. Now you have to tell the story of the bear. Not fair to leave us hanging. I don’t think it was too far for the Bear to not leave our bear bags hanging either… twice in one night!